Having a firm understanding of a chicken’s digestion system can help you figure out the reason behind a chicken’s digestive upsets. 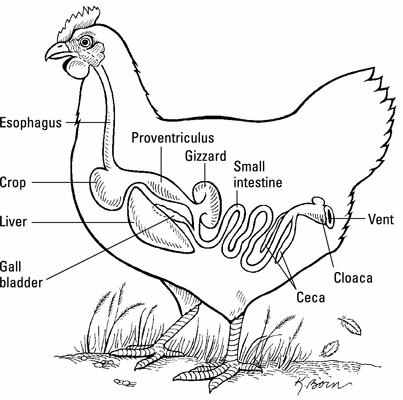 The figure shows the layout of the chicken digestive system, beginning to end. Mouth: A chicken can’t physically stick out her tongue or say “Ahh,” so you may never see the inside of a chicken’s mouth. If you have, you probably noticed the gaping hole in the roof of the mouth that connects with the nasal passages. What you saw wasn’t a defect. The gap is known in chicken anatomy circles as the choana, and it closes when a chicken swallows, so the bird can’t do the “milk coming out of the nose” trick. Crop: Chickens don’t have teeth, so they can’t chew food in their mouths. A chicken picks up food in her beak and swallows it with the help of her tongue. The food travels down the esophagus to the crop (which is really just a bulge in the esophagus), where the chicken stores the food until she can digest it at her leisure. Esophagus, stomach, and gizzard: The esophagus continues past the crop to the true stomach, the proventriculus, where digestion really gets rolling with the addition of hydrochloric acid and digestive enzymes. The food still hasn’t been chewed, though. That happens a little farther down the line in the gizzard (also known as the ventriculus), which is another unique anatomical feature of birds. This muscular organ acts as the bird’s teeth to grind the food and mix it with digestive juices, with the help of several small stones that have been hanging out inside the gizzard, ever since the chicken ate them a while back. If a chicken eats a small sharp object, like a staple or a bit of wire, it’s likely to get stuck in the gizzard. With all the grinding going on, the sharp object can eventually wear a hole through the gizzard, slowly killing the chicken. Be careful to keep your coop and yard free of small, sharp metal objects, or broken glass. Digestive tract: Chickens have a pancreas, liver, and intestines, which pretty much do the same things as they do in humans. The digestive tract layout differs, though, when you get to the cecum. The plural of cecum is ceca, which is useful to know, because birds have two. The ceca are blind pouches located where the small and large intestines come together. Birds extract a little extra nutrition out of their meal, especially fatty acids and B vitamins, through the fermentation process that happens in the ceca. Kidneys and vent: Chickens don’t pee, and they don’t have a bladder. Urinary system wastes (urates is the word used for bird urine) produced by the kidneys are simply dumped in with the digestive wastes at the end of the digestive system, at the cloaca, or vent. That’s why normal chicken droppings contain white urates mixed with darker digested material.